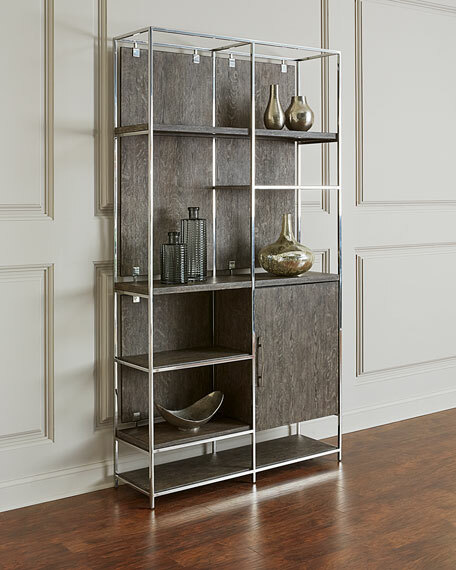 The style of this versatile bookcase is a warm, modern feel perfect for today's upscale, relaxed lifestyle. Crafted in sandblasted oak in a "Greige" color, highlighting the wood grain. Framed in by plated nickel and complimented by a sophisticated curved bar pull on the door. It features five fixed shelves and one door with a fixed shelf behind with a soft close door hinge. Easily at home by itself as a generous display/storage piece, it also works perfectly in pairs or in combination with the matching entertainment console. Handcrafted bookcase with stainless steel frame. 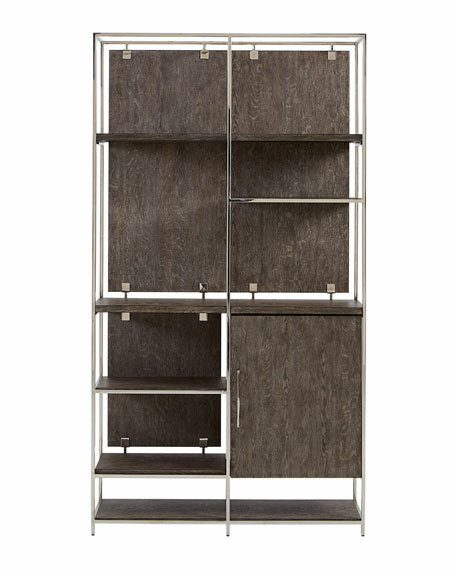 Overall, 48"W x 15"D x 88"T.
Rubberwood and hardwood solids with oak veneers. Features one door and six nonadjustable shelves. Light assembly required to assemble shelves. Boxed weight, approximately 231 lbs.